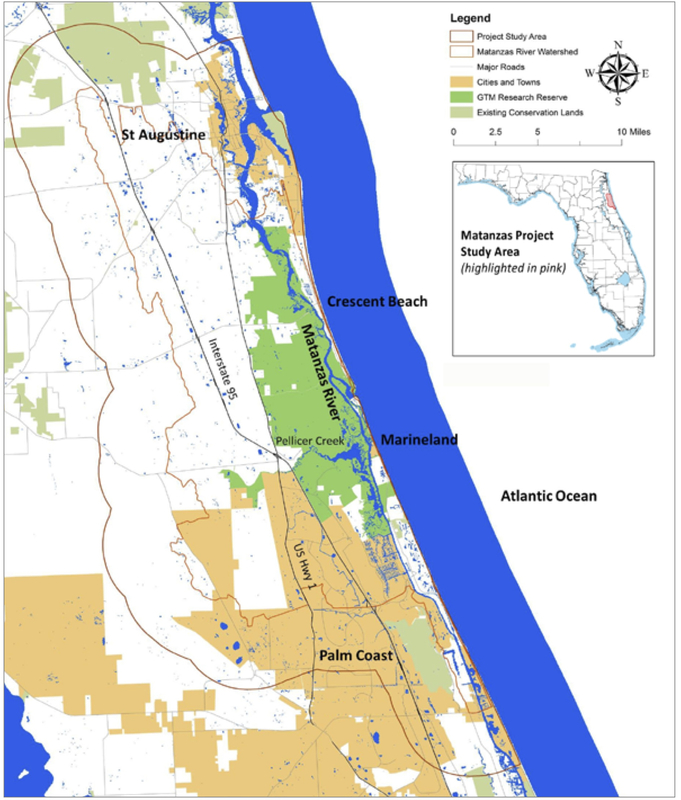 The Planning for Sea Level Rise in the Matanzas Basin project has released its final, 304-page findings report: Planning for Sea Level Rise in the Matanzas Basin: Opportunities for Adaptation. Accompanying the report are 13 appendices, which provide additional details of the project’s analytic methods, findings, and adaptation strategies. Also available are the GIS data gathered and produced by the project. The report is the culmination of over 3 years of sea level rise adaptation planning and public involvement led by an interdisciplinary team from the Guana Tolomato Matanzas (GTM) National Estuarine Research Reserve and the University of Florida, and a 14-member stakeholder Steering Committee. Funding was provided by the National Estuarine Research Reserve System Science Collaborative, a partnership between the University of New Hampshire and the National Oceanic and Atmospheric Administration (NOAA). The report’s main audiences are the GTM Research Reserve, and leaders, stakeholders, and citizens in the Matanzas study area in St. Johns and Flagler counties. The 264,000-acre study area, with a total population around 150,000 people, includes the cities of St. Augustine and Palm Coast, and many smaller incorporated and unincorporated communities. The project analyzed current and potential future conditions under scenarios of less than the historic rate of sea level rise (10 inches over the past 100 years) up to a rise of 8 feet (2.5 meters) by the year 2100. The mid-range scenario of 3 feet (1 meter) rise by 2100 could occur as early as 2075. The project’s main findings relate to the importance of the Matanzas Basin, its vulnerabilities, potential adaptation strategies, and current governance capacity. The Matanzas Basin has rich biodiversity, intact ecosystems, and environmental and cultural assets of state and national significance. The basin’s ecological resources deliver valuable ecosystem services to area residents and businesses. The high population growth rates in the two counties have the potential for creating future land use conflicts between conservation and development interests. The large study area afforded landscape-level assessments of multiple types of vulnerabilities through integrated, scenario-based geospatial analyses. 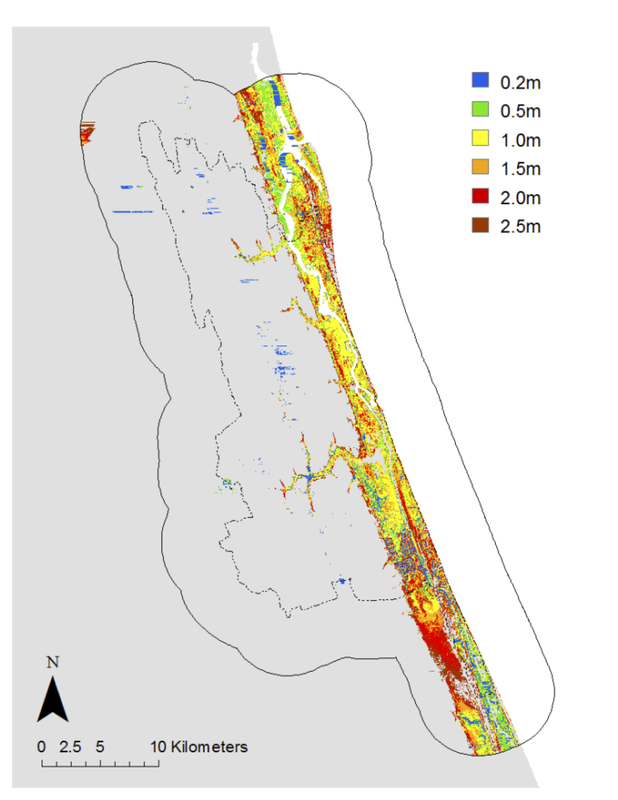 Sea Level Rise Affecting Marshes Model (SLAMM) analyses drew attention to a 2-mile wide strip of coastline as being highly vulnerable to sea level rise (see figure below). Inland impacts of sea level rise were limited and concentrated along the major streams, such as Pellicer Creek, due to the higher elevations of the Atlantic Coastal Ridge. Just to the west of the study area, future sea level rise impacts were observed in the Lower Eastern Valley due to rising of the St. Johns River. Impacts of sea level rise on the natural environment. Some wetland and open water dependent species gained habitat with sea level rise, however the majority saw net loss in habitat. Many of the habitat losses occurred within the GTM Research Reserve, which suggests the need for additional conservation lands to mitigate the losses. Biodiversity hotspots within the basin, such as along Pellicer Creek, had a moderate to high degree of impact. Impacts of sea level rise on existing development. Residents and stakeholders described current conditions – erosion, flooding, saltwater intrusion, and loss of natural amenities – that may become more severe as sea level rises. The project found that for all the sea level rise scenarios there were forecasted losses of currently developed land, assuming the land is not protected from inundation. In the Matanzas study area, the 3 feet sea level rise scenario affected 2,456 acres of currently developed residential land, which has over 16,000 residential units with more than 30,000 residents. Impacts of sea level rise on future development. All the sea level rise scenarios forecasted losses of undeveloped dry land, assuming the land is not protected from inundation. In the Matanzas study area, the 3 feet sea level rise scenario affected 1,637 acres of vacant, developable residential land. Under current growth rates, if future development (a) avoids areas vulnerable to 3 feet sea level rise and follows current land use policies, and (b) accommodates the relocation of current development in vulnerable areas, then by 2060 this new development was found to consume property parcels totaling 133,564 acres across the two counties. Currently platted parcels absorbed much of the growth and relocation. Impacts of future development on the future natural environment. The future development scenario described above impacted nearly all upland natural community types. Many upland species lost 10% to 30% of their habitat to future development, and biodiversity hotspots were affected. The large study area and its diversity of land uses led to the identification of a wide range of potential adaptation strategies. Many of the strategies are multi-functional, and oriented towards regional sustainability and resilience, thus they are likely to yield benefits for all future sea level rise scenarios. Future conservation priorities. Future conservation priorities highlighted undeveloped areas directly north and south of the GTM Research Reserve to compensate for the loss of estuarine habitats within the Reserve. In upland areas, lands having high conservation priorities included habitats around Pellicer Creek. Aggregated conservation priorities for regional resilience covered most of the Matanzas Basin, which stressed the importance of continuing initiatives for land conservation and best management practices. Future development to reduce impacts to future conservation priorities. Similar to the “trend” development scenario discussed above, a future “conservation” development scenario was created, which resulted in new development occupying 13,747 fewer acres in total, and impacting 63,800 fewer acres of future conservation priorities, as compared to the trend scenario for the two counties. Within the Matanzas study area, the conservation scenario impacted 20,259 fewer acres of future conservation priorities. The results indicate that policies guiding density and location of development are important for conservation, and that improvements over current land use policies are possible. Coastal hazard mitigation. To attend to the worsening threats to development from coastal hazards, the project created a toolbox of hazard mitigation strategies modified to explicitly address sea level rise and apply to the Matanzas area. Of particular interest are strategies that integrate designs for the built and natural environments, and that acknowledge the unique challenges posed by adaptation of historical assets. In order to understand the governance context, the project reviewed local and regional initiatives and policies for the goals of land conservation, smart growth, coastal hazards mitigation, and sea level rise adaptation. 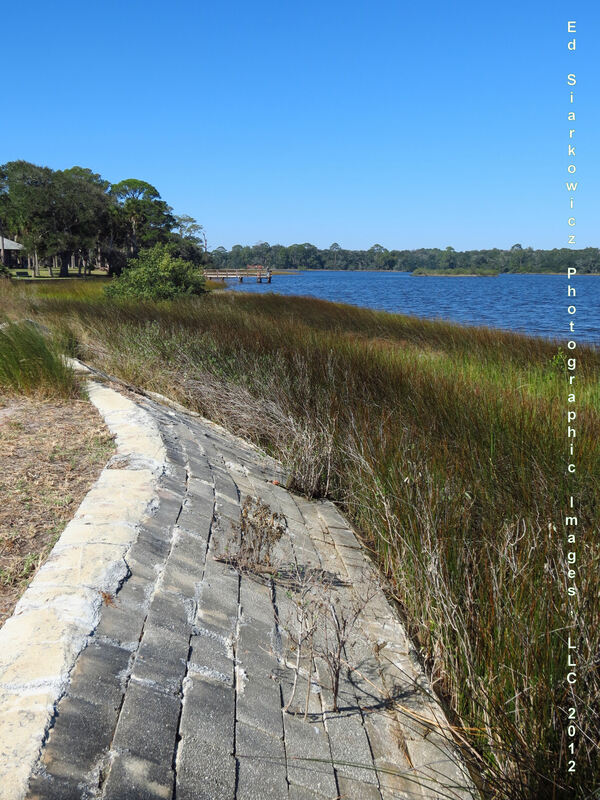 The review noted early leadership at the level of the Northeast Florida region, however local government plans in the Matanzas area had not yet begun to recognize and address the long-term threat of sea level rise. 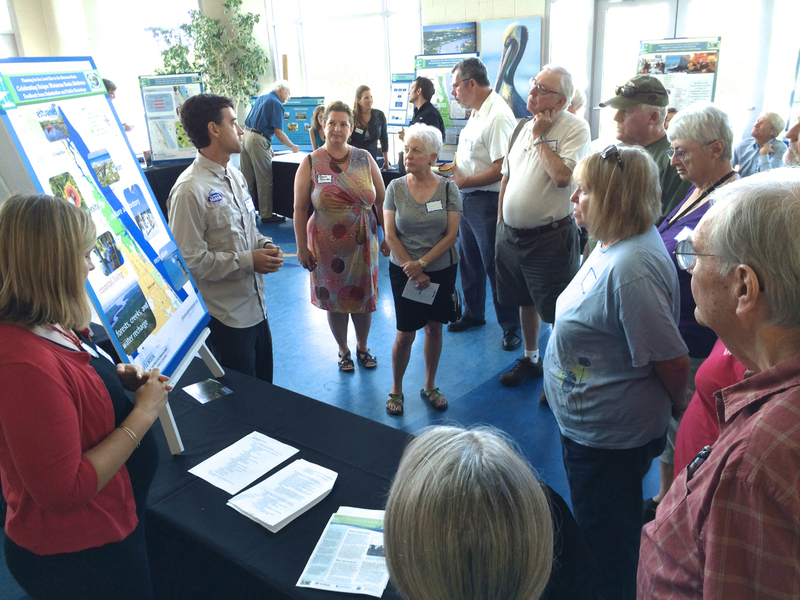 The project’s public input showed that Matanzas area stakeholders and citizens are ready to increase attention to sea level rise concerns. The GTM Research Reserve and the project’s Steering Committee reported that they were already using the information and data from the project, by incorporating it into regular operations and the design of new initiatives. The project’s findings represent a better understanding of the Matanzas area and its future, yet the project was only the beginning of adaptation planning. This work should be regularly updated and combined with information about other future changes as it becomes available. Synthesis report of findings for the Matanzas Basin and detailed appendices of analyses and strategies. Matanzas Basin study area geographic information systems (GIS) data gathered and generated, including metadata. A “guidebook” describing the planning approaches and tools used by the Planning Matanzas project. The approaches and tools have universal elements, have been tested, and are potentially useable by other coastal communities and regions in the United States. The synthesis report’s intended audience is the GTM Research Reserve and other leaders, stakeholders, and citizens in the region. The synthesis report will include sections on the Matanzas Basin’s vulnerability, adaptive capacity, and potential adaptation strategies. The guidebook’s intended audience is sites within the National Estuarine Research Reserve System, and it may be useful more broadly. The guidebook will provide a background on sea level rise adaptation planning, describe adaptation planning principles and key project phases, and detail a wide variety of technical, design, and engagement tools. The synthesis report and guidebook will be posted on the website. The GIS data will be available by request due to its large file size. September 8th, marked the final public workshop and was held at the Whitney Lab in Marineland. Community leaders, concerned citizens, a student group, and reporters were among the visitors who came to learn about the project’s findings. Participants, who registered for times available each half hour, began their visit with a short film giving an overview of the project. Afterwards, each group was guided into the atrium where multiple stations had been setup, each presenting major topics of the project. The presenters at each station were members of the project’s Steering Committee, staff of the GTM Research Reserve, and the University of Florida researchers. All the workshop materials (video and posters) are available on the Library page. “The Planning for Sea Level Rise in Matanzas” project is now moving into the final phase of publishing its results by January 2015. 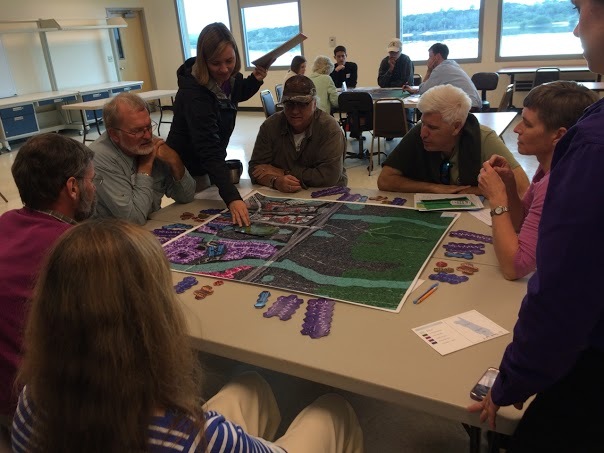 The input provided by the public during each workshop has been a valuable source of data that has assisted researchers in gaining a fuller understanding of the efforts needed for sea level rise planning. The final workshop is the culmination of several phases of public input over the past three years. 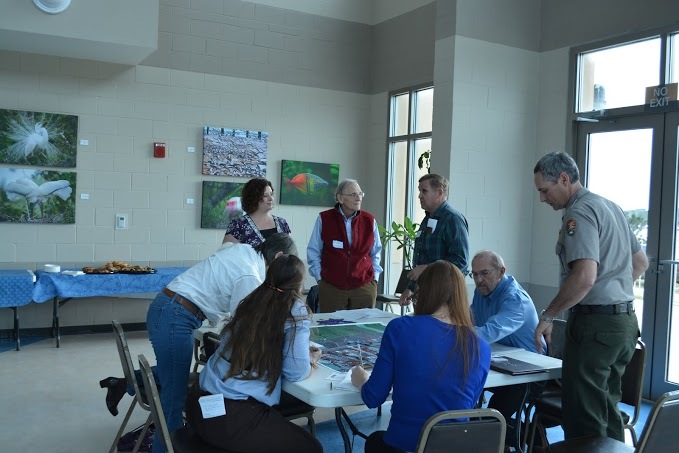 The first phase included stakeholder workshops to residents, youth, and professional groups. The research team presented the science of sea level rise, localizing impacts to the Matanzas basin and the surrounding region. Input was gathered from participants about area attributes through a visioning exercise and adaptation strategy preferences with participation in a role play game. The second phase of public input was the multi-stakeholder workshop. The focus was the intersection between sea level rise, land conservation priorities, and future land development in the region. Part of the process involved the group contemplating the design of conservation corridors to protect habitats of various species whose future would be impacted by sea level rise and development practices. Using a land density exercise, workshop participants were also given the opportunity to envision the degree of density future residents in the area would need to congregate, in order to ensure the availability of natural habitat. The upcoming event is free with light refreshments provided. To register, visit https://matanzasbasin.eventbrite.com. Senator Sheldon Whitehouse of Rhode Island recently embarked on a tour of the southeastern US to view the current effects of sea level rise and climate change to bring the information back to Congress. The Senator’s four-day trip began in the Carolinas on April 21st and concluded in Miami on April 25th. Among the places he chose to visit was the GTM Research Reserve on the afternoon of April 24th. 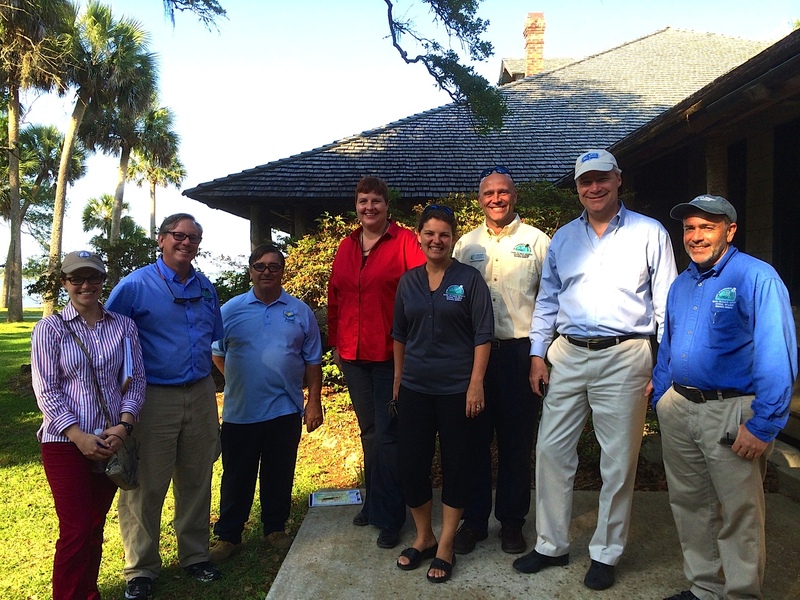 The Senator and his assistants toured the Reserve’s Environmental Education Center in Ponte Vedra, Castillo de San Marcos in St. Augustine, Fort Matanzas at the Matanzas Inlet, and Princess Place Preserve in Flagler County. Dr. Kathryn Frank presented an overview of the Planning for Sea Level Rise in the Matanzas Basin (see the presentation), which contained information about current and future potential impacts of sea level rise in the area, as well as local preferences and options for adaptation strategies. Additional information on Senator Whitehouse’s “Climate Road Trip” can be found on his website. 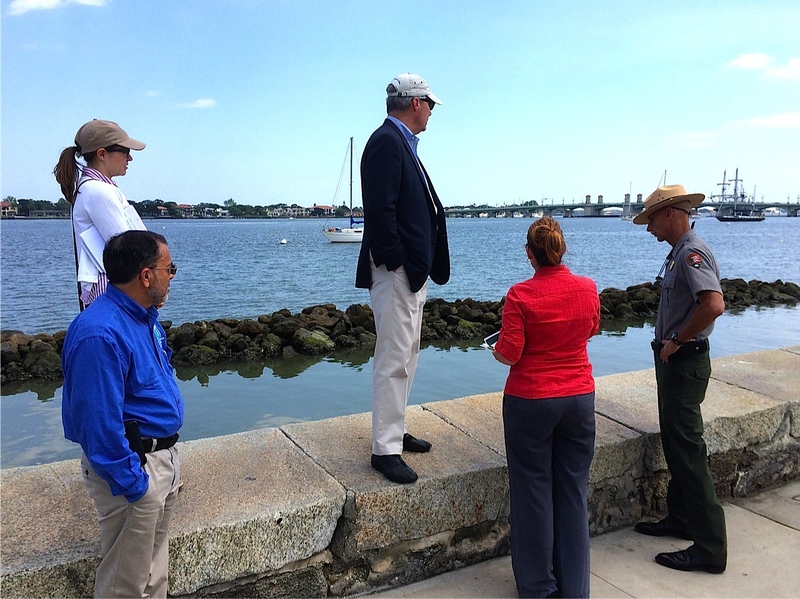 Senator Whitehouse observes the living shoreline project at Castillo de San Marcos, St. Augustine. 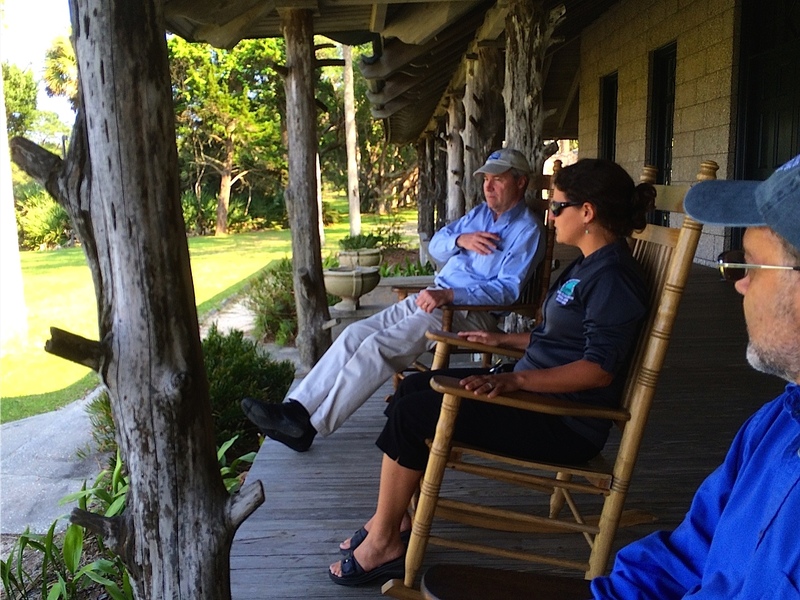 The senator enjoys the natural beauty of Princess Place Preserve while discussing the new GTM NERR field station for climate change and ecological services research located on site. At Princess Place. Left to right: Anna-Marie Laura (Sen. Whitehouse staff), Dr. Gary Raulerson (GTM NERR), George O’Dell (Princess Place Preserve), Dr. Kathryn Frank (UF), Dr. Nikki Dix (GTM NERR), Joseph Burgess (GTM NERR), Senator Sheldon Whitehouse, and Dr. Michael Shirley (GTM NERR). 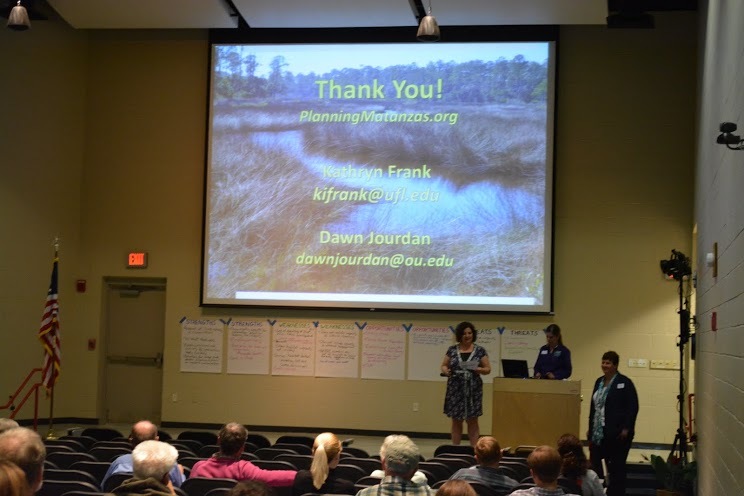 The Planning for Sea Level Rise in the Matanzas Basin project hosted a large public workshop on February 24th at the Whitney Lab for Marine Biosciences in Marineland. About 70 members of the public as well as professional and stakeholder representatives attended. After a welcome by GTM Research Reserve director Dr. Michael Shirley, project principal investigator Dr. Kathryn Frank and project collaboration lead Dr. Dawn Jourdan presented the results from the first set of Matanzas stakeholder workshops and the latest technical analyses for future scenario planning. The pair explained the high level of acceptance of sea level rise by earlier participants and the residents’ indication that they were already experiencing impacts from sea level rise in the region. The researchers related public preferences to potential sea level rise adaptation strategies such as living shorelines, water storage easements, and incentives for future development to locate inland in carefully selected locations to balance community and environmental values. Frank and Jourdan shared model-based scenarios of potential future development and conservation priorities in the Matanzas study area created by Drs. Paul Zwick and Tom Hoctor at the University of Florida. The purpose of the scenarios was to inspire dialogue about the relationship between sea level rise, future population growth and development patterns, and environmental conservation. The researchers showed the impacts of these phenomenon on habitats in the region for three species with diverse needs: shorebirds, gopher tortoises, and black bears. The researchers presented future land development scenarios that would allow the region to accommodate changes in the natural and built environment without sacrificing needed natural habitat. Next, Lia Sampson, Coastal Outreach Coordinator, led workshop participants in a SWOT (Strengths, Weaknesses, Opportunities, and Threats) analysis of the proposed conservation strategy. 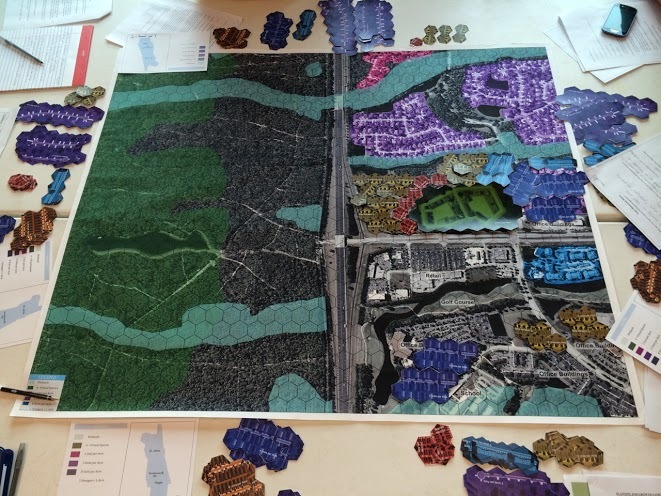 Last, Belinda Nettles, a doctoral student of Urban and Regional Planning at the University of Florida, and a team of student assistants facilitated a land development game which permitted small groups of residents to envision their ideas about future development on a hypothetical 700 acre tract. Electronic polling of individuals at the beginning and end of the workshop demonstrated a gained interest by participants to have their local governments promote infill development to meet future conservation and development goals. Drs. Frank and Jourdan along with Lia Sampson take closing questions and comments from Matanzas residents. The workshop SWOT analysis can be seen beneath the presentation screen. Dr. Jourdan discusses strategy with with Team 1 during the land development game. Participants on each of the six teams had to determine their group’s goals for meeting rising population demands while balancing conservation needs. Team 5 closes in on a development strategy. Areas providing habitat for focal species can be seen on the right side of the hypothetical site map in green. Areas already heavily developed with mixed residential and commercial use are located on the left. Team 3’s final proposal. Game pieces represented various residential unit densities that could be located as each team saw fit within their overall development goals. Seventy-five total pieces were necessary to reach the target level of accommodation for incoming residents. Team response matrix categorizing the design and development priorities of each participating team as well as final impressions and feedback. Examines the current and potential future impacts of sea level rise on natural and developed areas in the Matanzas River estuary and watershed. Applying this information and facilitating stakeholder and public input, the project team will make spatially explicit recommendations for conserving natural areas and systems, while accommodating projected population growth, to maintain quality of life, local economies, and wildlife.